Yep, those wiener dogs have lots of practical purpose. Hand-drawn with graphite, ink and watercolor. Buy the art print! New illustration in Entrepreneur Magazine! The Sin Issue. 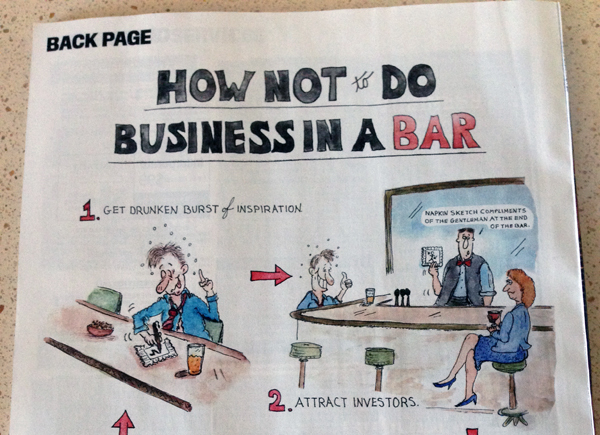 For Entrepreneur Magazine’s "Sin Issue" I conceived this fun illustration that's all about How NOT to Do Business In a Bar. It's featured on the back page of the print issue. Go check it out! New branding illustration featured in Entrepreneur Magazine! So excited to share my latest illustration for Entrepreneur Magazine! From gaining instant brand recognition to growing your customer base, here are my fast and foolproof branding tips to get ahead of the game. 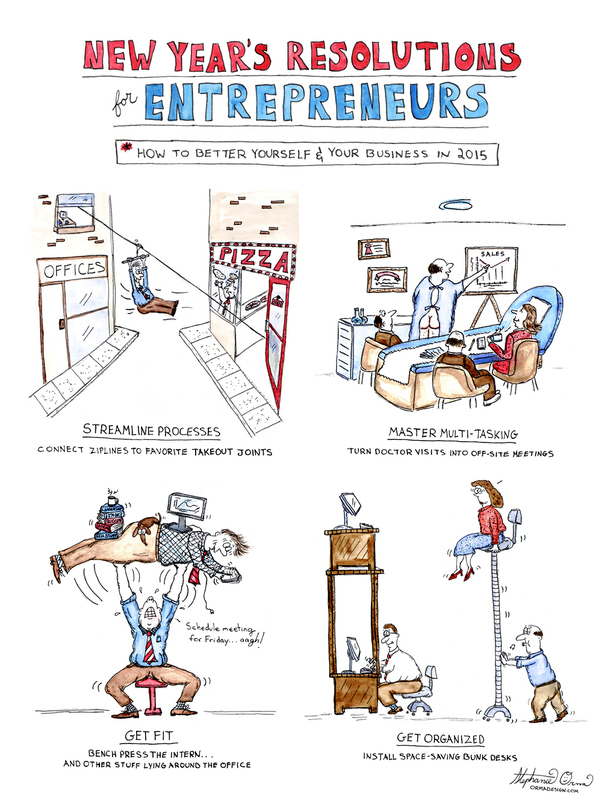 The illustration is featured on the back page of Entrepreneur Magazine's April issue. Go check it out! Thanksgiving illustration featured in Entrepreneur Magazine! Annoying relatives, pigging out, overeating. Yep, Thanksgiving is prime for innovation. Here's my latest illustration featured in Entrepreneur Magazine. So excited to share my illustrations for Marin Magazine's summer issue! The first is a "Tastes of West Marin" hand-drawn map featuring the best wine, cheese, and oysters in the county: You can check out more details here. She's SO Creative Signs with MGL Licensing! We've been signed! Our clever art is now represented by the awesome sauce London licensing agency MGL Licensing. She's SO Creative offers fresh, original images for a range of products including calendars, cards, diaries, stationery, homeware, apparel and more. Current licensees already include Moonpig.com! In the heart of beautiful downtown Tiburon, CA, May Madison is the go-to gourmet kitchen shop for all your culinary needs. They offer the highest quality cookware, cutlery, and kitchen accessories combined with the warm and welcoming customer service of a charming small town store. Adding a little whimsy to their already wonderful mix of eclectic kitchenwares, our outrageously clever aprons, napkins, and notepads are now available at May Madison too! She's SO Creative featured in 1000 More Greetings! She's SO Creative clever greeting cards is in a BOOK! Rockport Publishers recently released "1000 More Greetings: Correspondence for All Occasions" which features inspirational examples of invitations, announcements, self promotions, and greeting cards. And we're on pg. 27! The book is available at Borders, Barnes & Noble and Amazon. She's SO Creative one of 18 chosen to vie for feature in San Francisco's 7X7 Magazine! 3. Select She's SO Creative and submit!